Filmmaker Jerzy Porebski recently produced a digital Flip Book The Ice Warriors, illustrated by Marek Berger, on the first winter ascent of Everest (8848m). 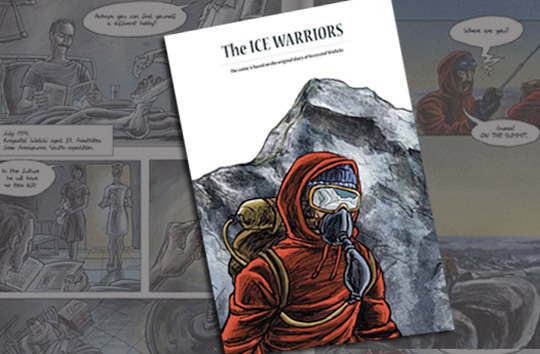 The Ice Warriors is available here, on the Adam Mickiewicz Institute's website, and can be accessed by clicking on the image below. Named for Poland's national poet, the Adam Mickiewicz Institute is tasked with promoting Polish culture abroad. Under the image is Alpinist's interview with Porebski. How did the idea to do a Flip Book come about? At the very beginning the cartoon was created in 2010. It took place at the same time as the thirtieth anniversary of the winter ascent of Everest. And the cartoon was expected at that time to be issued as a paper version by the Adam Mickiewicz Institute. I approached them with the idea of the cartoon and they provided money for the project. I suppose in 2010 the Flip Book wasn't even known as a form of media. And, the technical abilities of the Internet and the Institute's webpage were not good enough for the Flip Book medium. As Internet possibilities became more sophisticated the Head of the Institute, Mr. Pawel Potoroczyn, got back to the idea of the cartoon, but proposed to issue it as a Flip Book. This finally happened three weeks ago. And, to be frank, the delay in publishing it turned to be a positive event as the Flip Book, in my opinion, makes the cartoon far more available to potential readers. It also coincided with the success of Bernadette McDonald's book, Freedom Climbers as well as screenings of my film Kukuczka in the USA. How do you think the cartoon medium enhances a mountaineering story? You are an experienced movie maker, was it difficult or different to create a cartoon? Let me compare the mediums to telling a joke. You have to be skilled enough to tell a joke in many words, without being boring. But it is also a skill to tell the same joke in a few words while keeping it attractive and witty. Both ways are good if they reach their aims. So I would say, I cannot see any special challenge in making a cartoon instead of video. You simply need to think in a different way while creating cartoons. What do you hope the reader takes away from this project? My intent was also to promote Poland abroad. And making a mountaineering cartoon is a very different approach from telling stories about Chopin or Copernicus. I think it will be especially in reaching peoples on the Internet, mainly on Facebook, by the Embassy of Poland in Washington and the Kosciuszko Foundation in the U.S., which will let it reach audiences that aren't usually exposed to mountaineering. It will also be translated into Spanish and published in Peru. I hope Adam Mickiewicz Institute, who provided money for the project will be satisfied with this success as their mission is promoting Poland. Finally let me thank the Kukuczka Foundation for their help with it and my friend Krzysztof Wielicki for providing me with the original diaries of the expedition.